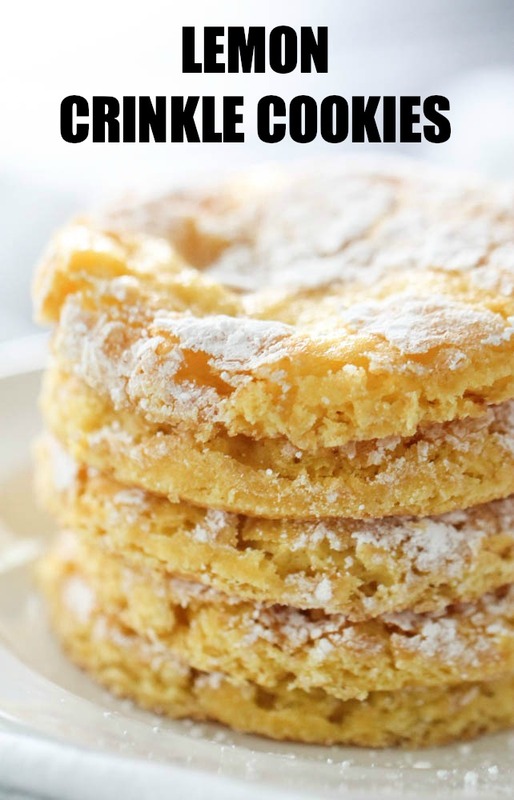 These Lemon Cake Mix Cool Whip Cookies are light, fluffy and melt in your mouth. Made with just 4 ingredients, this is one easy dessert recipe that your family will want to make over and over again! My husband loves anything lemon flavored. I think his absolute favorite dessert is our Gooey Lemon Bars. Sometimes he requests lemon bars over cake for his birthday! 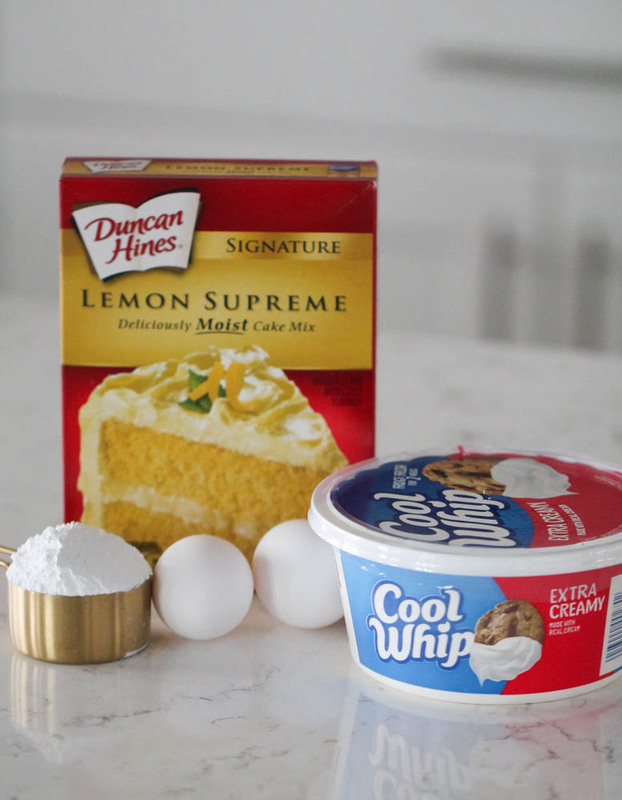 I wanted to whip up a quick after school snack for the kids and surprise my husband with something lemony and sweet, and these Lemon Cake Mix Cool Whip Cookies fit the bill. You could easily make these cookies with any other flavor of cake mix if lemon isn’t your thing. We have made these cookies using a strawberry cake mix for Valentine’s Day or a devil’s food cake mix if we were in the mood for something chocolatey and they have all been delicious. You won’t believe how easy it is to make these cookies, but be sure to read the directions so you don’t have any problems. This cookie dough is very sticky, so it does require some time in the refrigerator as well as using a spoon rather than your hands to handle the dough. To make these easy cookies, you will need a cake mix, eggs, Cool Whip and some powdered sugar. 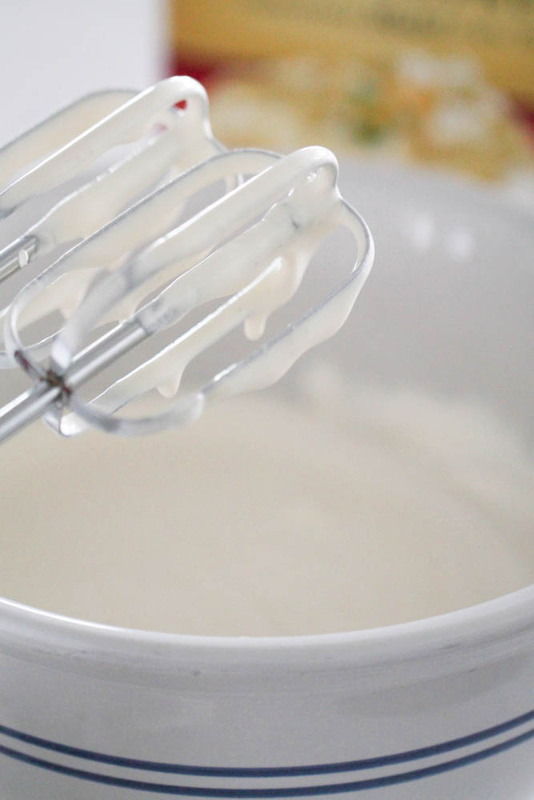 Using a hand or stand mixer, beat together Cool Whip and eggs until smooth. 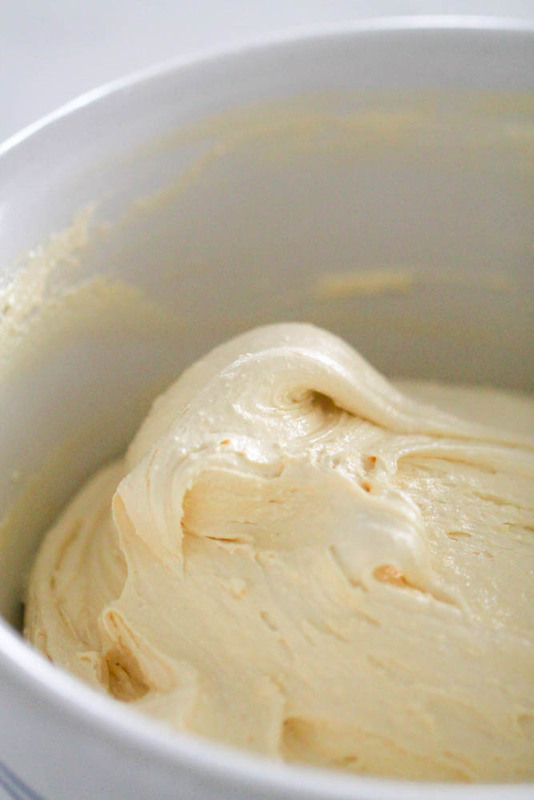 Add the cake mix and beat until well combined then place the bowl of dough in the fridge for 30 minutes. Take the dough out of the refrigerator and drop the cookie dough by teaspoons (or using a small cookie scoop) into a bowl containing the powdered sugar. 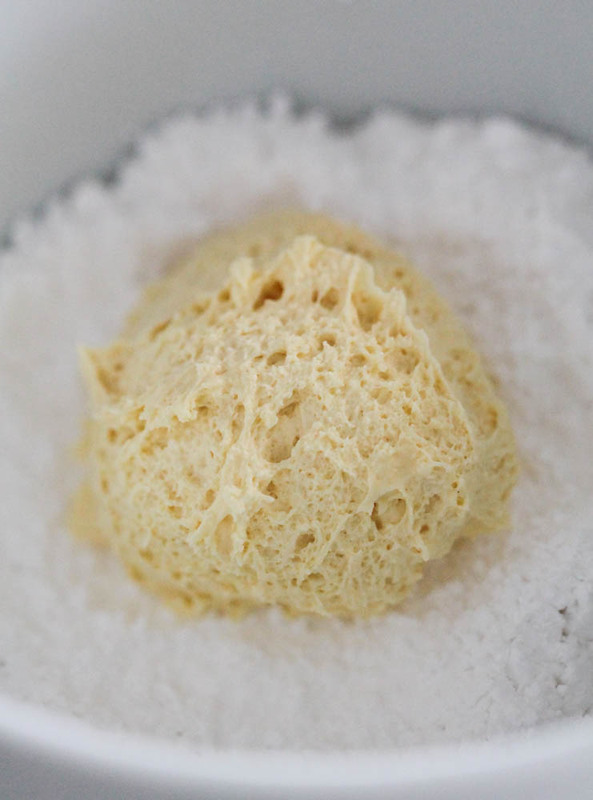 Coat the dough in powdered sugar using a spoon until it is completely covered, then you can use your hands to roll it into a ball. These cookies do flatten out quite a bit, so be sure to keep the balls of cookie dough around the size of a teaspoon. Place cookie dough on a baking sheet that has been sprayed generously with nonstick cooking spray or lined with a silicone baking mat. Bake at 350 degrees for 9-11 minutes, or until the edges are slightly golden brown. 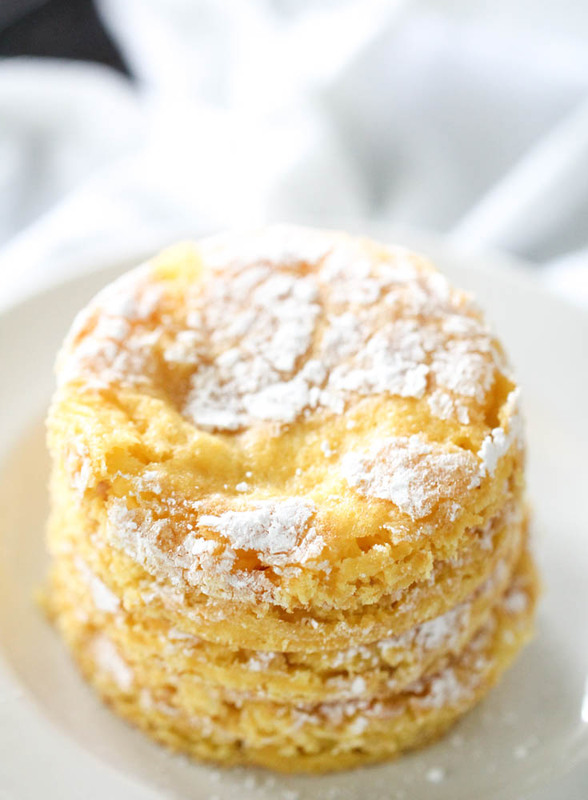 Light and fluffy lemon cookies made using a cake mix and frozen whipped topping. Spray a baking sheet with nonstick cooking spray or line with a silicone baking mat; set aside. In a large mixing bowl, beat together Cool Whip and eggs. Add the cake mix and mix until combined. The dough will be extremely sticky. Drop cookie dough by teaspoons into a bowl containing the powdered sugar and roll to coat. 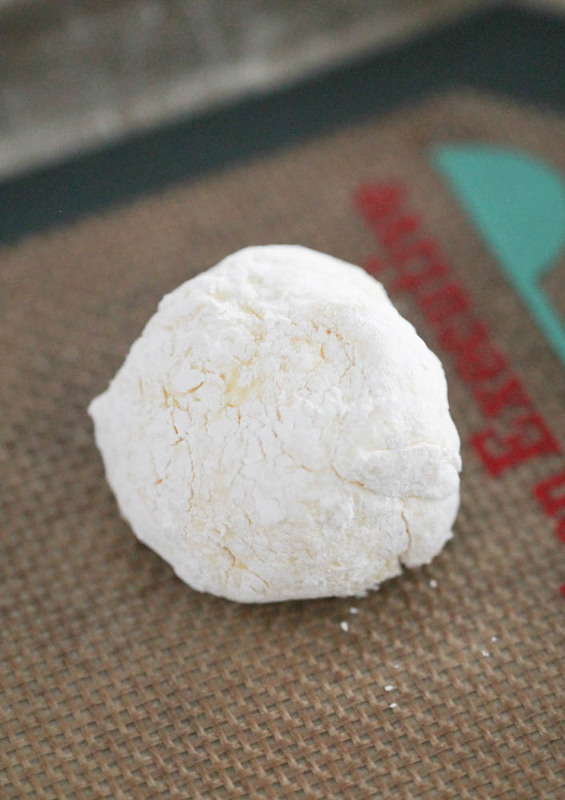 Once the dough is completely coated in powdered sugar, it will be easier to roll into a ball. Place cookie dough on prepared baking sheet and bake for 9-11 minutes, or until the edges are slightly golden brown. These cookies will flatten out, so be sure to keep each ball of cookie dough to around the size of one teaspoon. I made these.. And they are wonderful! Everyone loved them! The dough was very sticky! I took a plastic cup and put the powdered sugar in it.. Spooned the dough into the cup & then rotated the cup around so the dough would form inside the cup while getting coated with powdered sugar. I love cake mix cookies! When time is running out they are a great "go to". I make these cookies too - we call them Lemon Whippers! Thank you for sharing another scrumptious recipe! Seriously, I could bake forever with all of these yummy looking foods and desserts! Thanks for sharing! Thanks so much for dropping by the Be-Bop-A Blog Hop! MMM yummy now I have made them using a block of cream cheese 2 eggs and a tsp of vanilla and they turned out great!!! OoooOOo! I'm glad you shared this. I have a book group meeting coming up and we read The Particular Sadness of Lemon Cake this month. I'm thinking an array of lemon flavored desserts are in order! I made these today - I used a chocolate cake mix instead of lemon. OMGosh!! They are WONDERFUL! 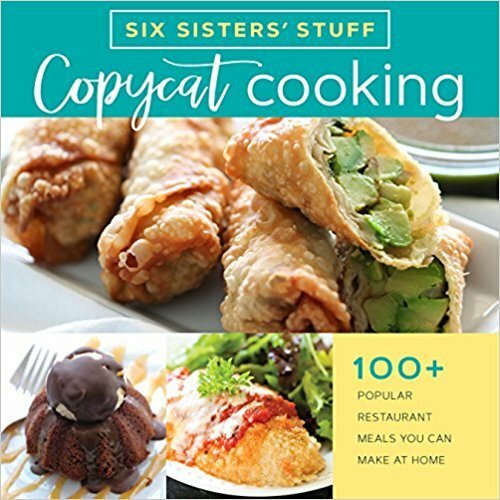 Looks nummy, can't wait to try----FYI:when printing out your recipe, it doesn't include the ingredients on the page. hmmmm...my version only uses one egg and I freeze the dough. Also, if you coat your hands with powdered sugar it makes it easier. I made with cream cheese, but I'll have to try these. I made them with carrot cake and they are great. Also if you use a cookie dough scoop then roll with a spoon it takes a lot of the mess out of the picture. Okay so I'm aging myself here but I had to let you know that my grandmother used to make these back in the 70's YIKES~~~~ anyway she called them "lemon whippersnappers" and I have been making them FoReVeR!!! You can use ANY cake mix (I did the pink cherry cake mix one time and the girlie girls loved them)By the way, your treats make me fat just looking at them!! !I will be making some of your yummies for a bake sale this weekend!! yum!!! I love these! The recipe I use only has 1 egg.. I wonder if 2 makes the dough less sticky? I just wanted to say that I love your blog! Love your recipes. I make these but don't use the eggs. They come out flat like the old "lemon coolers" that use to be sold in a box. They are a huge hit & I get requests to make them all the time. Your site is too addicting lol. I love these! I just got a bunch of cool whip cheap with coupons so this is a great recipe to use all the cool whip up. Thank you! I used a small ice cream scoop to drop into the powdered sugar and a fork to pick them back up. Also, used fat free cool whip and added lemon extract. They are yummy. These are so good, but I had a terrible time scraping them off the cookie sheet! I tried a greased cookie sheet, parchment paper, a silpat-type mat, an ungreased airbake cookie sheet, scraping them off immediately, waiting a few minutes after they came out of the oven...and I still feel like I had to chisel them off! What am I doing wrong? Just reading over the comments many have said they only use one egg and then freeze the dough. Don't know if that would help. One even said her recipe is similar but no eggs. It was a hard dough to work with, but we aren't sure why you are having such a problem with them sticking to the pan so badly. Sounds like you have tried everything. So sorry! I just made these! Wow! My cake mix was 3oz less so added 1oz flour and put 2 lemon jelly beans in the center - to die for! We have only made this recipe with cool whip, so not sure if real whipped topping would work. About how many cookies does the recipe make? I have a cookie exchange and need to plan ahead. Thanks the cookie sounds yummy. Makes about 3 dozen cookies. Just click on the MAGIC button under the picture and then click on NUTRITION. It will give you the nutritional info on the recipe. Just finished baking these crinkles -- came out fantastic and I think I will win the office cookie bake-off!! Super easy recipe, thank you!! Husband ate 3 already.....! Would these quality in the "freezes well" category? I'm making several types of cookies for a big event in three weeks. They should freeze well in an airtight container.